For more than 50 years, Colorite has been a leading producer of advanced medical-grade compounds used by some of the world’s foremost healthcare and medical device manufacturers. We are recognized for consistently meeting or surpassing exacting government and industry standards on a global level. 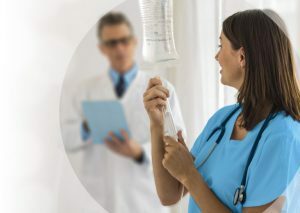 Our extensive line of polyvinyl chloride (PVC) compounds and thermoplastic elastomer (TPE) medical-grade compounds have been engineered to deliver the ideal solution for your specific product objectives. They are converted into a broad range of products including hemodialysis tubing, blood bags, endotracheal tubes and oxygen masks. Colorite services the global market with manufacturing in three geographic regions— United States, Europe and Asia Pacific. We work with our customers to develop new medical-grade compounds that can meet specific needs and enhance production efficiency. Our service-driven approach puts your requirements at the forefront of every interaction. Colorite is a business unit of Tekni-Plex, which uses advanced plastics and rubber polymer technology to create innovative compounding, tubing and packaging solutions. Colorite has an extensive line of custom compound solutions suitable for extrusion, injection and blow molding processes. We offer compounds with excellent gamma radiation resistance, as well as self-frosting and radiopaque materials. Colorite also has an extensive range of phthalate- and PVC-free thermoplastic elastomer compounds. We also have the capability to develop custom compounds tailored to specific equipment, applications and requirements. For world-class R&D capabilities, first-rate technical service and responsive sales assistance, please contact us to discuss your application. We’d like to show you how Colorite materials can help you meet your objectives. As part of the Tekni-Plex family, Colorite has the resources and commitment to invest in the people and technology for today’s products and tomorrow’s innovative solutions. Click here to request our White Paper.